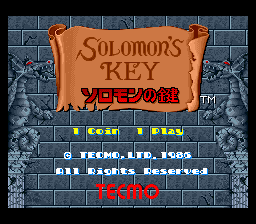 Solomon's Key (known in Japan as Solomon no Kagi) is a puzzle game developed by Tecmo in 1986 for arcade release on custom hardware based on the Z80 chipset. It is better known as a 1987 port to the NES, although it also appeared on many other game systems of the time, including many popular European home computers, and a Japanese only release for the Sega Master System (known in Japan as the Sega Mark III). The NES conversion was released for the Wii Virtual Console in 2006. Solomon's Key is generally recognized as one of the most difficult games to appear on the NES or any other platform for that matter. The player must overcome unlimited enemy spawning, challenging level designs, a countdown timer, Dana's fragility, and limited ways to dispatch enemies. In addition, it's easy for players to unintentionally make levels impossible to clear while playing them. 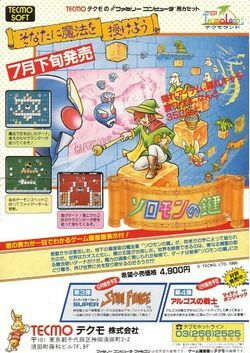 Solomon's Key also has many hidden items and secret levels that are hard to find which enhances the reward for playing. The ending also slightly changes depending on which secret levels the player finds and completes, if any. The main character, Dana is sent to retrieve "Solomon's Key" to restore the world to light from demons that were accidentally released. The object of the game is to advance through the 50 rooms of "Constellation Space" by acquiring a key to the door that leads to the next room before a timer runs out. The game incorporates elements of the platform shooter genre. Dana can run, jump, create or destroy orange blocks adjacent to him as well as create fireballs to destroy demons. The orange blocks can also be destroyed by jumping into them twice. Along the way Dana can acquire items to upgrade his firepower and extra lives as well as items that award bonus points and unlock hidden rooms. With certain items, Dana must make, then break blocks (sometimes in a certain manner) to make these appear. When the world was still in a state of chaos, evil spirits roamed the world freely and rioted. The magic document "Key of Solomon" was the product of great King Solomon's magical research. It described how the evil spirits were confined to the underground constellation Miya. Centuries later, one man sought to prove the existence of Solomon's Key. He discovered constellation Miya at last and arrived at Solomon's Key. He took the magical document, and in the next moment, evil spirits overflowed and the world and time were torn! The world reverted back into its earlier chaotic state, and became a kingdom of the darkness, governed by evil spirits. The king of the lilac garden fairies Yutora ordered magician Dana to perform the restoration of the world. Dana has now broken into the unexplored region of the dangerous constellation Miya where the Solomon's Key was stolen. This page was last edited on 14 April 2015, at 11:25.